This makes it critical that repairers, customers and insurers understand tire-related best — and worst — practices, a topic addressed in the Jan. 23 broadcast on vehicle suspensions. “Nothing else matters” if the tires are bad, McFarlin said on the Collision Hub show. The National Highway Traffic Safety Administration estimated 719 tire-related crash deaths and 19,446 tire-related crash injuries occurred in 2015. You don’t want tires to sit around for more than three years, as they can break down, Montanez said. NHTSA also warns consumers against such “tire aging” — a phenomenon which might be particularly common on spare tires and tires in the southern parts of Sun Belt states — and notes that some tire manufacturers demand all tires be replaced after 6-10 years of age. It seems like shops would want to check the TIN on the tires a supplier provides, the supplier’s conditions (such as sunlight, warmth and storage, according to NHTSA) and the OEM or tire manufacturer specifications. “You want to be very careful of that,” Montanez said of aged tires. He raised the idea of a tire wearing out prematurely, and this 2013 KCTV story describes a successful aging tire lawsuit after an 18-year-old’s death. “As a professional …we should be using professional tools,” Database Enhancement Gateway Administrator Danny Gredinberg said. Montanez suggested a digital tread gauge for mathematical simplicity, and Felder observed that some DRP agreements even mandated a specific gauge. 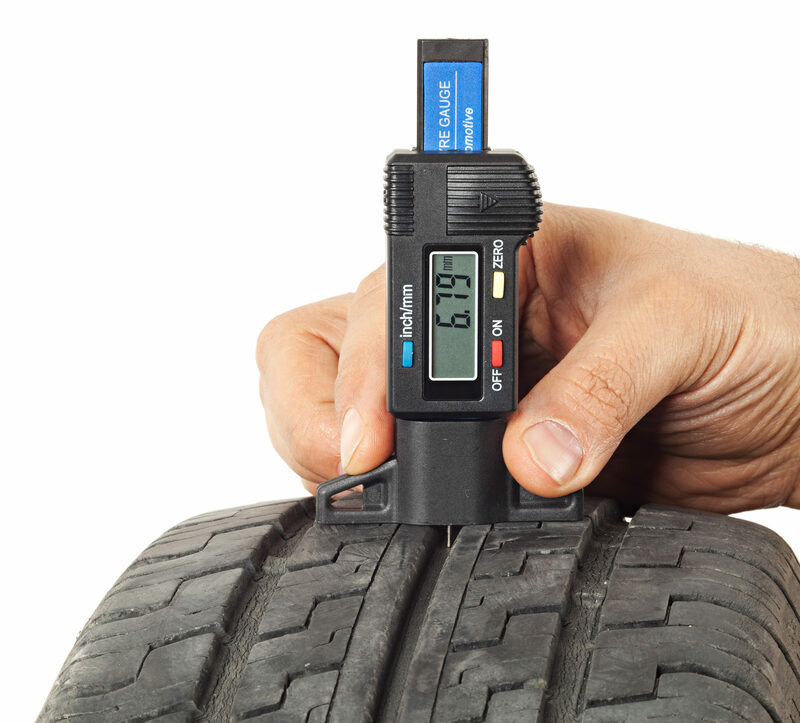 Not all tire manufacturers deliver the same maximum tread depth, McFarlin said, and Montanez said 10/32 inches or 11/32 were common treads on new tires. 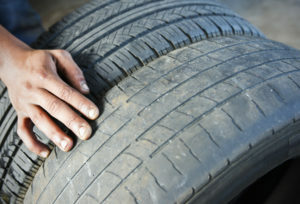 Typically, states demand a tire be scrapped when it reaches 2/32 inches of tread, according to Montanez. Shops should also be aware of what Felder said appeared to be a new phenomenon of requests to shave tires. “We’re hearing about it more and more,” she said. Basically, you shouldn’t be doing it. Montanez said the technique was only relevant to race vehicles on tracks outside of the main U.S. roadways — not something that should be done on commercial or customer vehicles. Tire manufacturer recommendations can demand pairs of tires or even all four be replaced for an issue related to a single wheel, according to Montanez. Felder said that for a consumer, it might come as a surprise that manufacturer repair procedures dictate all four tires — not just one — be replaced, leading to shops offering tire shaving. But it’s a bad move for a repairer, she said. “The legality of that is just not good at all,” she said. It’s irrelevant if an insurer demanding the reshaving wants to warranty the tires, Felder said. Montanez said it was no different than changing oil in one’s vehicle — deviate from what the OEM says to put in your engine, and it’s not the manufacturer’s fault when something goes wrong because of the offending fluid. Montanez advised a repairer confronted by such a customer to “send it down the block.” And an insurer — a third party — certainly can’t tell a collision repairer what to do with a customer’s tire, he said. Felder said “it’s not a good idea” to shave tires, and it has nothing to do with what a policyholder owes or doesn’t owe under a policy. Montanez said that it was the owner’s choice to buy such a car and the carrier’s choice to insure it. When a group of experts were contacted by the show about shaving tires, “everyone erupted in laughter” at the idea, according to Felder. You absolutely won’t be the “only one” refusing to shave tires. 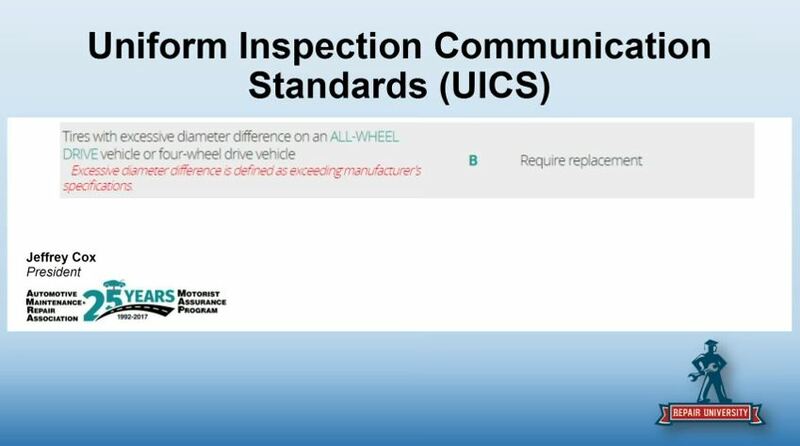 McFarlin said that the Automotive Maintenance Repair Association, whose expert-prepared Uniform Inspection Communication Standards dictate how automotive service writers should communicate items found on an inspection to customers, demands replacement for “excessive diameter difference” on four-wheel or all-wheel drive wheels. “Excessive diameter difference is defined as exceeding manufacturer’s specifications,” according to AMRA. That means that mechanics nationwide should be telling a customer that the replacement of such tires is “required,” not merely “suggested,” according to AMRA. Unlike the majority of OEM repair procedures, information about proper tire handling for a body shop might not be available on the car manufacturer’s service website, Gredinberg noted. He, Felder and Montanez explained that sometimes, such information or warranty details can be found in the vehicle owner’s manual, owner’s section of an OEM website or a separate tire information document provided to an owner. The answer might be in “the simplest place,” resting in the glove compartment the whole time, Gredinberg said.